My choice when I got up today was to do a bit of work on the Imperial War Museum's War Memorials Register (I am slowly adding all of Barnsley's 640+ war memorials to their website), or to continue working my way through my ancient 'to-do' list. Put on one side in 2012 when I began researching war memorials for a talk commissioned by the Friends of Barnsley Archives I have barely touched my own family history for over four years. 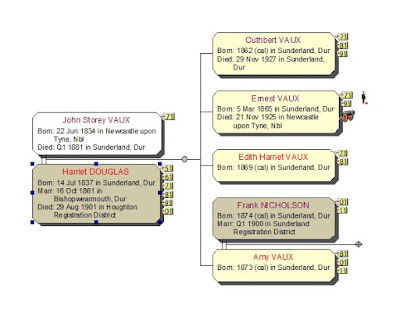 Several items on my list refer to the Vaux family of Sunderland. I am distantly related to this well known brewing family, as my first cousin 4x removed, Harriet Douglas, b.1837 in Sunderland, married John Storey Vaux in 1861. In the snip above little tags after the boxes for each person indicate which census returns I have found them. These 'flags' can be customised in Family Historian to indicate all kinds of facts, I have just added a little cannon to Ernest Vaux to show that he was a soldier prior to WW1 and a 'Tommy' symbol to show he served in WW1. Other than those two military flags this is how I found this part of my family tree this morning. It's a bit thin on the ground! If you look at this old post about a Vaux family gravestone in Bishopwearmouth Cemetery you will see an even earlier version of this tree section which includes a previous generation of the Vaux family. There are quite a lot of Vaux's for me to research. But today's connection combines two of my favourite things - WW1 and beer! This is reason that I wanted to write about one of the Vaux family today. It is a beer bottle label, possibly dating back to 1901. 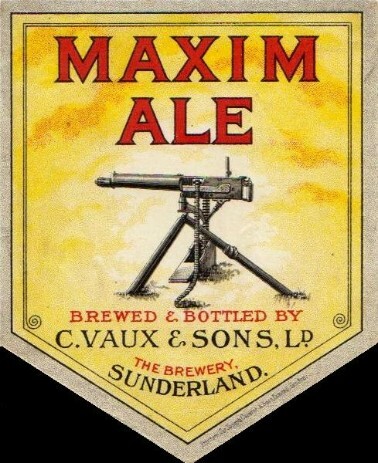 I wonder how many people know that the present beer name refers back to a machine gun! 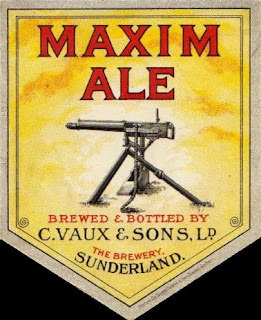 The original beer, Maxim Ale, was apparently first produced to celebrate the return from the Boer War of my 2nd cousin 3x removed, Major Ernest Vaux. He had commanded Maxim guns in the 5th Imperial Yeomanry during operations in the Transvaal, Orange River Colony and Cape Colony. 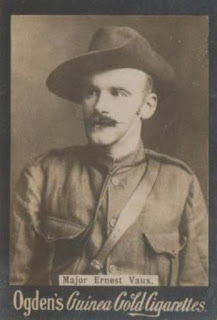 He was awarded the Queen's South Africa Medal in 1901 with clasps commemorating these campaigns, see snip above from UK Campaign Medals on Ancestry. 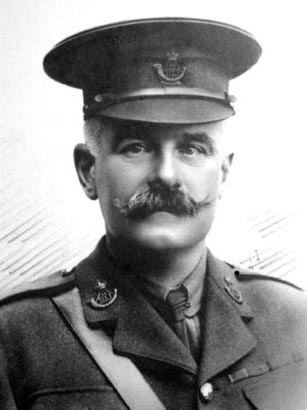 He was appointed a Companion of the Distinguished Service Order (DSO) in November 1901 (from Wikipedia). The websites I have looked at today offer slightly different stories about the origin of the 'Double' which now forms an integral part of the name. The Maxim Brewery site suggests that the beer was originally quite strong, but the strength was reduced because landlords complained their customers were falling asleep. Both this site and Zythum - An Ale Anthology do agree that the strength of the beer was doubled in 1938 and at this point the name was changed to reflect this. I wonder if the strength was originally reduced during WW1 when legislation was brought in to reduced the detrimental affect of alcohol consumption on the war effort? After his return Ernest Vaux married in 1906 to the daughter of a local shipowner. I have mentioned before how my Sunderland family branches worked and married within a close community of middle class business families. The middle names of their children frequently reflect the surnames of mothers and of other local families, maybe those of godparents or other relatives. For example Ernest's fourth child and only son was baptised Peter Douglas Ord Vaux in December 1913. Douglas will refer to his grandmother's maiden name and Ord to his mother's. When the Great War began in 1914 Ernest Vaux, being an experienced old soldier, stepped forward immediately. He had commanded the 7th Battalion of the Durham Light Infantry since 1911. He reached France in 19 April 1915 where he was mentioned in dispatches many times. Lieutenant Colonel Vaux was invalided home in April 1918 suffering from dysentery. He died in 1925 aged 60. You can find his page on Lives of the First World War here. 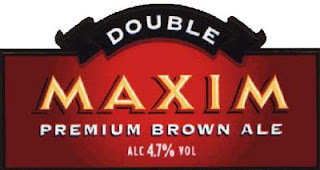 A few months ago I regaled some the OH's CAMRA colleagues with this story during a beer tasting in Maison Du Biere at Elsecar Heritage Centre after spotting a bottle of Double Maxim for sale. I've been meaning to write it down ever since.